When we're tired, late or just plain lazy, the last thing we want to do is wash and blow-dry our hair. But going to work with greasy hair isn't really an option. Dry shampoo can be a lifesaver, but it's actually the hairstyle that will dictate whether our mane passes for clean or gives away its unwashed status. 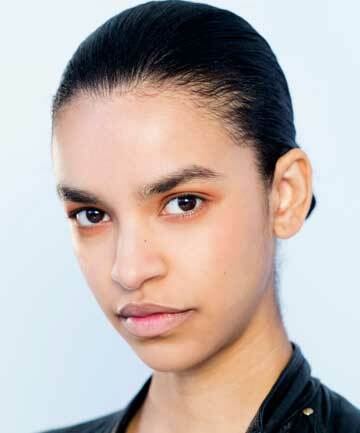 To successfully conceal oily roots, celebrity stylist for Seven Haircare Cash Lawless recommends styling tresses in a sleek ponytail, topknot, twist or a braided style, such as Dutch braids, boxer braids or halo braids. And don't underestimate hair accessories. "Nothing covers like a great headband," he says. "The more ornate, the more distracting." Fernando Salas, creator of White Sands Haircare, is a fan of classic ponytails, high buns and anything that gets the front layers of hair off the face. He suggests twisting, clipping or braiding front layers and bangs back for the perfect greasy hair hairstyle. According to Lawless, the biggest mistake you can make is wetting dirty hair or putting heat on it. "Do not iron or blow-dry your hair if it is greasy," he says. "This will emulsify the grease and make it exponentially worse." It's also damaging to hair. (Oops.) Co-founder of IGK Hair Care Franck Izquierdo adds that brushing hair can also make the greasy situation worse and flatten hair. With these tips in mind, have a look at 19 greasy hair hairstyles that conceal oily roots so well no one will know it has been two — or three — days since your last shampoo. We'll keep your secret.